Clutching an image of author, the late Gore Vidal, bail jumper Julian Assange has been arrested in London. GUEST BLOG / By Jon Allsop, Media Today, Columnist, Columbia Journalism Review. Julian Assange is under arrest. Mid-morning, UK time, a bevy of police officers hauled Assange, the divisive founder of WikiLeaks, out of Ecuador’s embassy in London, where he had lived under diplomatic immunity since 2012, and into a waiting truck. In a video message, Lenín Moreno, Ecuador’s president, confirmed that his government had taken the “sovereign decision” to withdraw asylum from Assange due to “his repeated violations to international conventions and daily-life protocols.” One of Assange’s lawyers said that characterization was incomplete—she tweeted that Assange had also been arrested in response to a US extradition request (British police later confirmed this)—another accused Ecuador of doing America’s bidding for financial reasons. 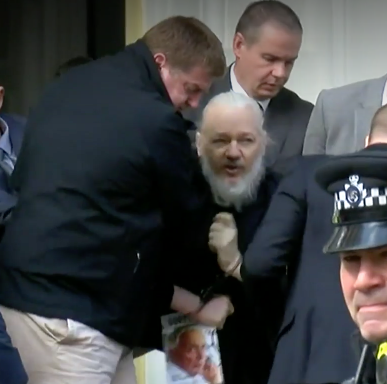 As he was dragged away, Assange appeared to shout “the UK must resist!” In his hands, he clutched a copy of Gore Vidal’s History of the National Security State. Assange’s arrest marks the end of his extraordinary, long spell in the embassy. He first took refuge there in June 2012 to avoid extradition to Sweden, where authorities wanted him to answer charges that he sexually assaulted two women. (Assange and his supporters called the allegations a pretext to extradite Assange to the US, where he could have faced the death penalty over his work for WikiLeaks. Although Swedish prosecutors did drop their arrest warrant for Assange in 2017, the case has never been closed: Sweden is expected to provide an update later today.) In August 2012, Ecuador bucked intense pressure from the British government and granted Assange’s request for asylum; at the time, the decision was variously interpreted as an escalation of Ecuador’s hostile relationship with Washington, and a bid to improve its poor reputation on freedom of speech. Its government expressed hope that Britain would allow Assange to leave the embassy for Ecuador itself, but Britain made clear that he would be arrested the minute he set foot outside. And so Assange stayed put—for nearly seven years. In recent months, Assange’s relationship with Ecuador soured. 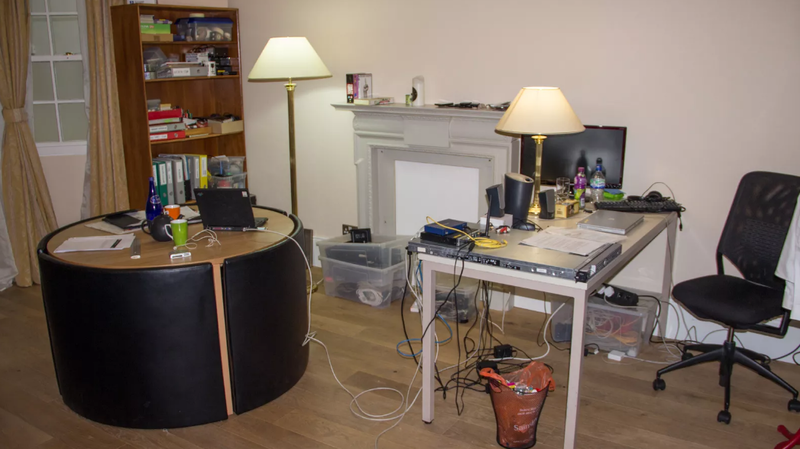 Last year, officials cut his internet access and restricted his access to visitors; Assange, they said, was in violation of an agreement he had made to quit meddling in other countries’ affairs. In October, Assange sued Ecuador, which he accused of breaching his “fundamental rights.” Late last week, WikiLeaks predicted, in a tweet, that Assange would be kicked out of the embassy within “hours to days.” In his final days of refuge, WikiLeaks said Assange was living a “Truman Show existence” under intense surveillance. Assange’s lawyer says the Americans have finally got their way. Late last year, the US Justice Department accidentally revealed, in a filing in an unrelated case, that it has filed secret, unspecified criminal charges against Assange. As The New York Times reported, Assange “would have to be arrested and extradited if he were to face charges in federal court, altogether a multistep diplomatic and legal process.” The first of those steps, at least, has now been taken care of. Assange has been a wanted man in America ever since he orchestrated WikiLeaks’s dumps of incriminating government documents in the early 2010s, in particular, the diplomatic cables leaked by Chelsea Manning. His publication, in 2016, of emails stolen from senior Democratic Party officials by Russian operatives hardly helped his case. Going forward, journalists will need to be vigilant. Assange’s case is specific, but the way the Justice Department responds to his arrest could have serious implications for all of us. This day was always likely to come. As governments change, so, too, do their diplomatic alignments: since he took office in Ecuador in 2017, Moreno has reportedly been looking for ways to rid himself of Assange, calling him “an inherited problem.” While we wait for more information, it’s interesting to take a moment to reflect on Assange’s years in exile. Mostly, we forgot about him; sometimes—during bursts of media attention related to his work, health, or associates—he cast a long, familiar shadow across the public eye. With his actions on behalf of the Russians in 2016, he chiseled himself, indelibly, into the annals of American history. It’s an extraordinary story. Manafort: In December, Kenneth P. Vogel and Nicholas Casey reported for the Times that in 2017, Paul Manafort, Trump’s now-jailed former campaign chairman, offered to mediate between Moreno and the US government for the handover of Assange. The Times story followed a contentious report, in The Guardian, that Manafort met three times with Assange in the embassy, including around the time he was appointed to the Trump campaign, in 2016. Other outlets were not able to match the reporting. The National Enquirer is up for sale. According to The Washington Post’s Sarah Ellison and Marc Fisher, Anthony Melchiorre, the hedge-fund manager who controls the Enquirer’s owner, American Media Inc., is pressuring that company to sell—partly for financial reasons, partly because he has grown “disgusted” by the Enquirer’s reporting tactics. The Enquirer’s tactics, of course, are not new, but AMI boss David Pecker’s close relationship with Trump—see: the Enquirer’s work to “catch and kill” stories during the campaign; the recent Jeff Bezos imbroglio—has brought intense scrutiny. CNN reports that Bezos will soon meet with federal prosecutors; he has claimed (without publishing evidence) that Saudi Arabia was behind the Enquirer story about his love life. EXACTLY, WHY DID THE CHICKEN CROSS THE ROAD? SUNDAY REVIEW / SHORT STORY BY SHERWOOD ANDERSON.